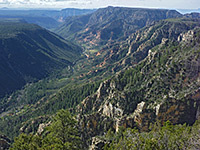 Four trails climb to the wooded rim of Oak Creek Canyon, north of Sedona; two on the east side (Thompsons Point and Thomas Point, both lightly used), and two on the west side, Wilson Mountain and AB Young. This latter ascends a rather steep section of the walls towards the north end of the drainage where the ravine is at its narrowest, gaining nearly 2,000 feet in less than 2 miles, ending with a more level section along a ridge then across a wooded plateau to an alternative trailhead at the East Pocket Knob fire lookout tower, a location reachable by a gravel track through the Coconino National Forest. Most of the trail crosses exposed, southeast-facing slopes, not wooded but covered instead by bushes, yucca and opuntia cacti, so the views are good from the start, even though the panorama is not quite as spectacular as places further south, since this northern section of Oak Creek Canyon is generally quite overgrown, with relatively few patches of red rocks. 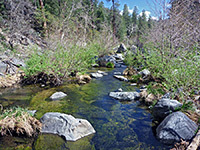 However, all the surroundings are greatly changed in character due to the 2014 Slide Fire, which has burnt several miles of the west side of Oak Creek Canyon, including all of the course of the AB Young Trail. 12 views along the AB Young Trail. The trail starts at the Bootlegger day use/picnic area, which has about ten parking spots, beside and slightly above Oak Creek. The standard $5 Red Rock Pass is required for all parked vehicles, available from a self pay fee station. An unmarked path descends to the creek, which is crossed by hopping between boulders, and another runs both ways along banks on the far side, reaching the rusty iron sign for the AB Young Trail (number 100) a short distance south. The path heads diagonally up a wooded slope on the west side of the creek, soon emerging above the trees to an open, boulder strewn, partially burnt area, then enters more overgrown ground beyond, and soon passes the Red Rock Secret Mountain Wilderness boundary. 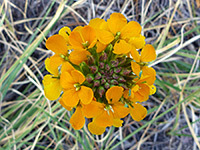 The vegetation includes manzanita, juniper, various other bushes, yucca, Parry's agave, nolina, large-padded prickly pear cacti (opuntia engelmannii) and a scattering of wildflowers - an environment that persists all the way to the mixed conifer forest on the canyon rim. The trail follows a minor, steeply sloping ridgeline, close to a few outcrops of whitish sandstone, all the time staying just north of the crest but in one place reaching the top, where it looks down over a sheer drop-off to the south. The upwards gradient is consistently steep, and the path climbs via 15 pairs of switchbacks. Towards the top of the main ascent, at a point already higher than the opposite canyon rim (6,400 feet), the route veers northwards a way and enters a little gully, beneath a group of lichen-covered rocks, as the surroundings become a little more overgrown and in some places the bushes nearly obscure the path. The canyon rim is reached soon after (1.6 miles from the start), and the views now extend a long way south, over Slide Rocks State Park and the red benches of Wilson Mountain, towards the mouth of Oak Creek Canyon beyond. Ponderosa pine is the most abundant tree in the plateau forest; other species include Arizona cypress, Englemann spruce and Douglas fir, mixed with wildflowers such as mountain bluebell and yellow pea. The trail now climbs much more gently, along the wooded rim of a side ravine, to the final overlook, which is high enough for views eastwards over ridges and gorges towards the Verde Valley. Wilson Mountain rises due south, to about the same elevation (7,000 feet), separated by the wide corridor of Stirling Canyon. 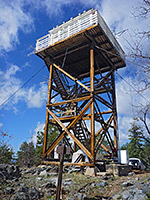 The last, poorly marked section of the path turns away from the rim, up a slight incline to the East Pocket Knob lookout tower, which is staffed in summer, and reached by a 23 mile drive on forest tracks, starting from AZ 89A.